Like many people who have seen the movie "Once," I loved it. Perhaps that's why it was followed up by the filmed documentary "The Swell Season." I believe the documentary showed how Marketa Irglova's and Glen Hansard dealt with fame and it's effect on their relationship. I have yet to see the documentary or for that matter the Broadway play adaptation of the film. I have been fortunate enough to see both singer/songwriters perform separately in the flesh. I have seen Hansard twice as a part of Doveman's monthly 2011 shows at Le Poisson Rouge. And as I am now writing about her, I have seen Marketa Irglova a Joe's Pub. Both Marketa and Hansard have a certain je ne sais quoi, her's being classical and his being folk and R&B. Irglova walked on stage promptly at 7:00 accompanied by her 3 band mates, one of which is her now husband bassist, Tim Iseler. One of the other two was the extremely intriguing percussionist and vocalist Aida Shahghasemi, Intriguing because, for most of the show, she looked straight ahead in seemingly deep concentration. It seemed as if she was in a trance, perhaps she was, because her playing seemed flawless. 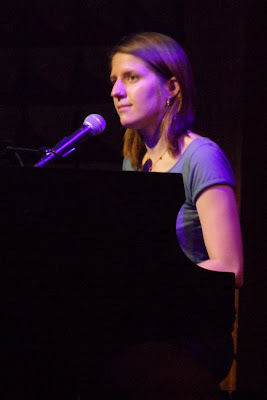 Talking from her bench behind the piano, Irglova expressed her gratitude to her audience for being there for her performance in New York, which she now considers her hometown. The first song, "Your Company" was co-written with Rob Bochnik, who was also present and playing guitar. As expected, Irglova did "If You Want Me" from "Once." Strange, but then not so strange, is that on the recording she sounds like a little girl compared to how she sounds now. But not only have Irglova's vocals matured, so has the arrangement. There were points in the song when Bochnik's guitar part against the Irglova's piano part sounded like a harpsichord and when both women singing harmony together sounded angelic. The biggest applause of the evening came at the end of that forth song. At times during the set Irglova was funny in a very cute and charming way. I think, due to the fact that English is her second language, she sometimes says funny things then has to back pedal toward what she meant to say. Such was the case when she told the story setting up "Only In Your Head." She told the audience how she had an upset stomach and a friend offered her a pharmaceutical drug. She said she split the pill, not thinking it would have any effect but after an hour she started slurring her words and seeing spiders. The actual song, though somewhat short, was as interesting as the setup. Irglova and Shahghasemi sang a very close vocal harmony over a haunting piano part. Irglova went directly into the next song which was the very sweet "Let Me Fall In Love" with it's title sung as a lilting hook. All of the tempos in Irglova's set were in the same moderate range which would have been less than inviting had she not kept it interesting by sometimes changing the meter and feel. From what I recall, "The Leading Bird" was the only song in a waltz feel. 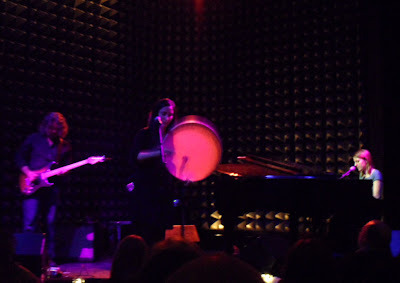 It was also another of the many songs that Shahghasemi sang beautiful harmony all the way through, as she played percussion. I think I was most impressed all evening by the two women singing together. The song that followed "Go Back" felt more like a contemporary pop ballad then a indie one. In fact it felt structured very differently from any of the other songs in the set. Even the piano solo, that Irglova played in the middle of the song sounded much different from her playing on her other songs. Irglova premiered a new song that she said would be released on an EP coming out in May. The song was inspired by the "Twilight" series of books. Irglova made the audience laugh by telling us that she submitted the song for one of the movies but they didn't use it. I, personally, don't get why they didn't. The song is named "Here and After," and as she was playing, it evoked images of werewolves and vampires in the moonlight. According to how she tells it Irglova and Aida Shahghasemi met in a coffee shop in Brooklyn. Irglova said they were introduced to each other as fellow musicians but when Shahghasemi told her that she played the daf, Irglova didn't know what it was. So the two ladies met the following night and Shahghasemi brought her daf along. Irglova then told the audience that, although we had been hearing Shahghasemi play the daf, we needed to hear it by itself to get a full sense of the instrument. She then had Shahghasemi perform solo which lasted about 3 1/2 minutes. Honestly, I was pretty amazed by sound that came out of what, wikipedia refers to as a frame drum and looked to me like an over-sized tambourine. As you may have noticed, I have mentioned Shahghasemi many times during this write up. That's because her intense look, her daf playing and her harmonies all added a tremendous amount to Irglova's set. After the daf solo, Irglova announced they were going to do an Iranian folk song. The song was magical with Irglova, this time harmonizing to Shahghasemi with a harmony that sounded quite modal. Irglova went directly into her next to last song "Fortune Teller," which had a bit of middle eastern flavor to it. After the song, Irglova came from behind the piano to introduce the band before setting herself up for the last song on guitar. She told the audience to feel free to sing along with the line "On My Mind" at the end of the song - which they did. When the band dropped out to just let the audience softly sing, it felt like a spirtual ending to a really wonderful set. Irglove came back for an encore, ending with the two most beautiful songs from Once. And I have to admit with Shahghasemi sharing the vocals on "Falling Slowly," I didn't miss Hansard. It was great show.